This case describes a furcal perforation in a mandibular first molar accompanied by furcal lesion which has been managed after one month. Root canal treatment was performed; subsequently, the defect was repaired with calcium enriched mixture (CEM) cement. The endodontically treated tooth was restored with amalgam. A 24-month recall showed no evidence of periodontal breakdown, no symptoms, in addition to completes healing of furcal lesion. According to physical and biological properties of the newly introduced CEM cement, this novel material may be suitable for sealing and repairing the perforations. The present case report supports this hypothesis. The following case verifies that CEM cement is an appropriate material for furcal perforation repair in patients. A 39-year-old male referred to the private endodontic clinic with an acute abscess adjacent to the left first mandibular molar. Clinical examination showed that the tooth was tender to percussion, sealed coronally by temporary cement, and exhibited slight mobility. Radiographs showed a furcal perforation, resulted in a lesion. Two apical radiolucencies were also observed, which implied pulp necrosis [Figure 1]. The medical history was non-contributory. Treatment options which were indicated for the tooth were extraction and surgical/non-surgical repair of the perforation. Regarding the patient preference in saving the tooth via a non-surgical procedure, furcal perforation repair with CEM cement was chosen. After administration of local anaesthesia (Lidocaine 2% with epinephrine 1:80000; Daroupakhsh, Tehran, Iran) and with a rubber dam in place, the temporary restorative material was removed and a correction in access cavity was made. Cotton pellet was placed in the orifice of perforation. 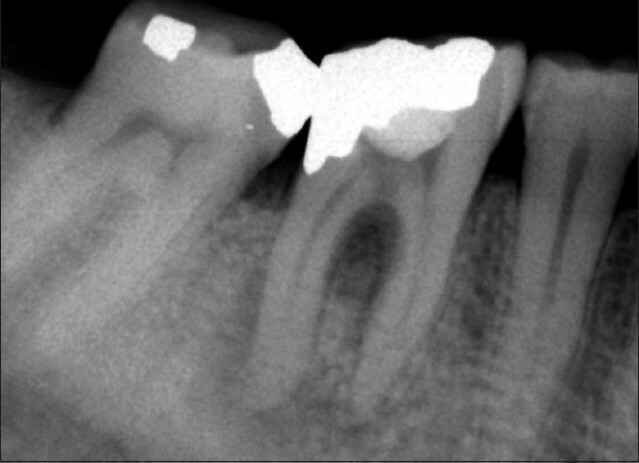 The canals was cleaned and shaped using Profile 0.04 files (Dentsply, Maillefer, OK, USA) by step-back flaring technique and constant irrigation with 2.5% sodium hypochlorite and then obturated with gutta-percha points and Roth 801 root canal sealer (Roth International, USA) using lateral condensation. The perforation site was irrigated with 2.5% sodium hypochlorite and normal saline. CEM cement (BioniqueDent, Tehran, Iran) was prepared according to inventor's instruction and was placed into the pulp chamber with an amalgam carrier, and gently packed with a cotton pellet to obtain a good adaptability [Figure 2]. The cement was covered with a moistened cotton pellet and Cavit temporary restoration material (ESPE America, INC., Norristown, PA, USA). At the 1 and 7-day follow-ups, the patient was asymptomatic and his pain and swelling subsided. He was referred for coronal restoration of endodontically treated tooth. Two years after treatment, radiography showed a complete osseous healing at the apices and the furcation region as well [Figure 3]. The time lapse between perforation and repair is one of the most prognostic factors for success of perforation repairs. The patient in the present case report was referred to endodontic clinic one month after the furcal perforation. He presented a bifurcal perforation in the left first mandibular molar, probably because of an erroneous access preparation. Such perforations lead to injury of periodontium in the bifurcation, bacterial contamination, formation of inflammation and bone resorption. , Therefore, treatment outcome of the furcal perforation depends on prevention of microleakage and control of tissue inflammation via sealing of the perforation site with a biocompatible material. The success of the treatment with CEM cement is attributed to removal of contaminants as well as cleaning of the pulp chamber, perforation, and wound site with copious amounts of 2.5% NaOCl before placement of this cement. Besides, it is likely that the antibacterial effect  in addition to high pH  of CEM cement contributed to further bacterial reduction. One of the interesting radiographic features was formation of normal PDL [Figure 3], indicating the biocompatibility of the CEM cement. This feature can, in turn, be attributed to low cytotoxic effect of CEM cement on different cell lines, , which promotes osteogenesis and cementogenesis,  which allow regeneration of the PDL around the site of injury. Additionally, this novel cement released calcium and phosphorus ions from indigenous sources result in a rich pool of OH - , Ca 2+ and PO4 - ions. , These elements are used in the process of hydroxyapatite (HA) production. Furthermore, a recent SEM study showed that distribution pattern of calcium, phosphorus, and oxygen in the surface of the CEM cement was comparable to that of surrounding dentin. This finding indicates that the composition of the cement is similar to dentin. HA is a main component of dentin; therefore, similarity between CEM cement and dentin might help the cementogenesis over it. This feature is hypothetically responsible for its biocompatibility and its other optimum specifications. CEM cement was considered as the material of choice based on the results of in vivo studies which revealed that CEM cement is able to stimulate dentinogenesis after direct pulp capping  and pulpotomy in animals  and humans,  apexogenesis  and also cementogenesis after perforation repair or surgery. , If the positive result of this "delayed repair of furcal perforation" in human beings is this good, there would seem to be promise for use of the CEM cement in a timelier manner with recent perforations. After two years, the tooth remained asymptomatic with no clinical signs of pathology; radiographic examination showed signs of normality and complete osseous repair, and the patient was satisfied of saving the tooth. More cases are needed to substantiate the effectiveness of CEM cement for repair of furcal perforations, but early indications are promising enough to suggest its use. 1. Cohen S, Hargreaves KM. Pathways of the Pulp. 9th ed. St. Louis: Mosby; 2006. 2. Kvinnsland I, Oswald RJ, Halse A, Grψnningsaeter AG. A clinical and roentgenological study of 55 cases of root perforation. Int Endod J 1989;22:75-84. 3. Ibarrola JL, Biggs SG, Beeson TJ. Repair of a large furcation perforation: a four-year follow-up. J Endod 2008;34:617-9. 4. Bryan EB, Woollard G, Mitchell WC. Nonsurgical repair of furcal perforations: a literature review. Gen Dent 1999;47:274-8. 5. Tsesis I, Fuss Z. 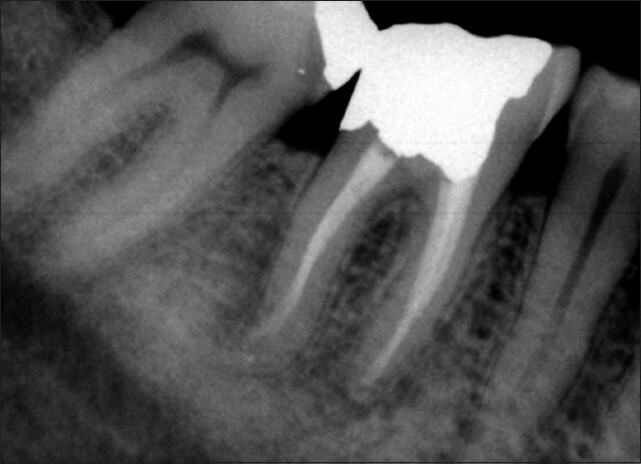 Diagnosis and treatment of accidental root perforations. Endod Top 2006;13:95-107. 6. Aguirre R, elDeeb ME, elDeeb ME. Evaluation of the repair of mechanical furcation perforations using amalgam, gutta-percha, or indium foil. J Endod 1986;12:249-56. 7. Alhadainy HA, Himel VT. Evaluation of the sealing ability of amalgam, Cavit, and glass ionomer cement in the repair of furcation perforations. Oral Surg Oral Med Oral Pathol 1993;75:362-6. 8. Ford TR, Torabinejad M, McKendry DJ, Hong CU, Kariyawasam SP. Use of mineral trioxide aggregate for repair of furcal perforations. Oral Surg Oral Med Oral Pathol Oral Radiol Endod 1995;79:756-63. 9. Main C, Mirzayan N, Shabahang S, Torabinejad M. Repair of root perforations using mineral trioxide aggregate: a long-term study. J Endod 2004;30:80-3. 10. Torabinejad M, Hong CU, McDonald F, Pitt Ford TR. Physical and chemical properties of a new root-end filling material. J Endod 1995;21:349-53. 11. Asgary S, Shahabi S, Jafarzadeh T, Amini S, Kheirieh S. The properties of a new endodontic material. J Endod 2008;34:990-3. 12. Asgary S, Eghbal MJ, Parirokh M. Sealing ability of a novel endodontic cement as a root-end filling material. J Biomed Mater Res A 2008;87:706-9. 13. Asgary S, Eghbal MJ, Parirokh M, Ghanavati F, Rahimi H. A comparative study of histologic response to different pulp capping materials and a novel endodontic cement. Oral Surg Oral Med Oral Pathol Oral Radiol Endod 2008;106:609-14. 15. 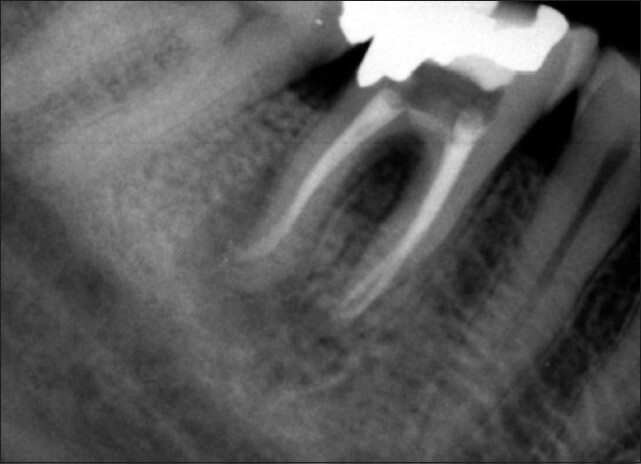 Nosrat A, Asgary S. Apexogenesis treatment using a new endodontic cement: A case report. J Endod 2010;36:912-4. 17. Asgary S, Kamrani FA. Antibacterial effects of five different root canal sealing materials. J Oral Sci 2008;50:469-74. 18. Asgary S, Moosavi S, Yadegari Z, Shahriari S. Cytotoxic effect of MTA and New Endodontic Cement in human gingival fibroblast cells: a SEM evaluation. NY State Dent J 2009. In press. 19. Amini Ghazvini S, Abdo Tabrizi M, Kobarfard F, Akbarzadeh Baghban A, Asgary S. Ion release and pH of a new endodontic cement, MTA and Portland cement. Iran Endod J 2009;4:74-8. 20. Asgary S, Eghbal MJ, Parirokh M, Ghoddusi J. Effect of two storage solutions on surface topography of two root-end fillings. Aust Endod J 2009;35:147-52. 21. Fuss Z, Trope M. Root perforations: classification and treatment choices based on prognostic factors. Endod Dent Traumatol 1996;12:255-64. 22. Seltzer S, Sinai I, August D. Periodontal effects of root perforations before and during endodontic procedures. J Dent Res 1970;49:332-9. 23. Balla R, LoMonaco CJ, Skribner J, Lim LM. Histological study of furcation perforations treated with tricalcium phosphate, hydroxylapatite, amalgam, and life. J Endod 1991;17:234-8. 24. Sathorn C, Parashos P, Messer HH. Effectiveness of single- versus multiple-visit endodontic treatment of teeth with apical periodontitis: a systematic review and meta-analysis. Int Endod J 2005;38:347-55. 25. Penesis VA, Fitzgerald PI, Fayad MI, Wenckus CS, BeGole EA, Johnson BR.Outcome of one-visit and two-visit endodontic treatment of necrotic teeth with apical periodontitis: a randomized controlled trial with one-year evaluation. J Endod 2008;34:251-7. 26. Weiger R, Rosendahl R, Lφst C. Influence of calcium hydroxide intracanal dressings on the prognosis of teeth with endodontically induced periapical lesions. Int Endod J 2000;33:219-26. 27. Ghoddusi J, Tavakkol Afshari J, Donyavi Z, Brook A, Disfani R, Esmaeelzadeh M. Cytotoxic effect of a new endodontic cement and mineral trioxide aggregate on L929 line culture. Iran Endod J 2008;3:17-23. 28. Asgary S, Eghbal MJ, Parirokh M, Ghoddusi J, Kheirieh S, Brink F. Comparison of mineral trioxide aggregate's composition with Portland cements and a new endodontic cement. J Endod 2009;35:243-50. 29. Tabarsi B, Parirokh M, Eghbal MJ, Haghdoost AA, Torabzadeh H, Asgary S. A comparative study of dental pulp response to several pulpotomy agents. Int Endod J 2010;43:565-71. 30. Asgary S, Eghbal MJ, Ehsani S. Periradicular regeneration after endodontic surgery with calcium-enriched mixture cement in dogs. J Endod 2010;36:837-41.